You might not realize this, but you don’t need software to run web proxies. You just purchase your proxies and then you input the information into your web browser. Once it’s in your browser, you’re good to go. You’re free to browse the web anonymously. It really is that simple. Since you don’t need to install software, you don’t have to worry about that annoying bloatware slowing you down. You do have to concern yourself with one thing, though. 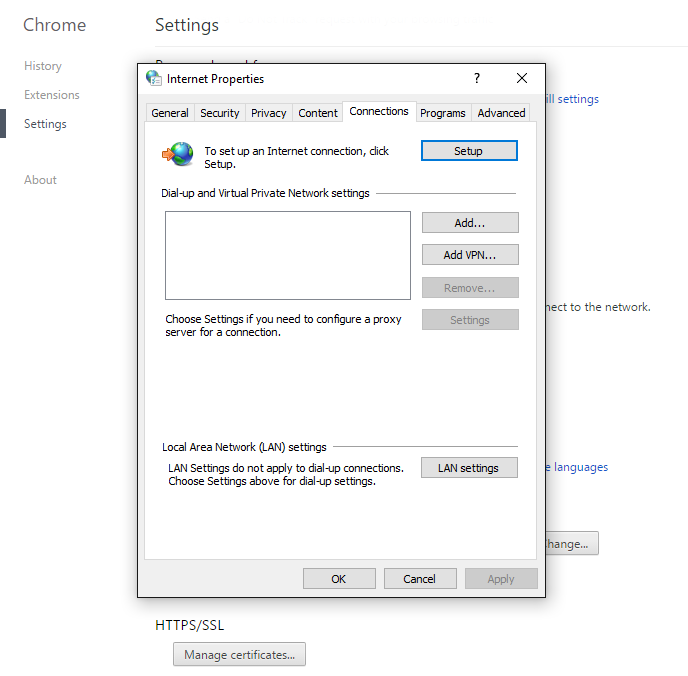 How do you install the proxy’s settings into your web browser? It actually depends on which browser you use. While all of the browsers are similar, they all have unique settings that you need to familiarize yourself with before moving forward. Take some time to learn how to install the settings in all of the browsers, or just look for your preferred browser on the list. Then, you’ll be ready to browse the web without anyone knowing what you’re doing. At that point, you can use the settings at home, on the road, or even at work. Also, stick around for some additional tips for using proxies with your web browser. These tips will help you get started with proxies. 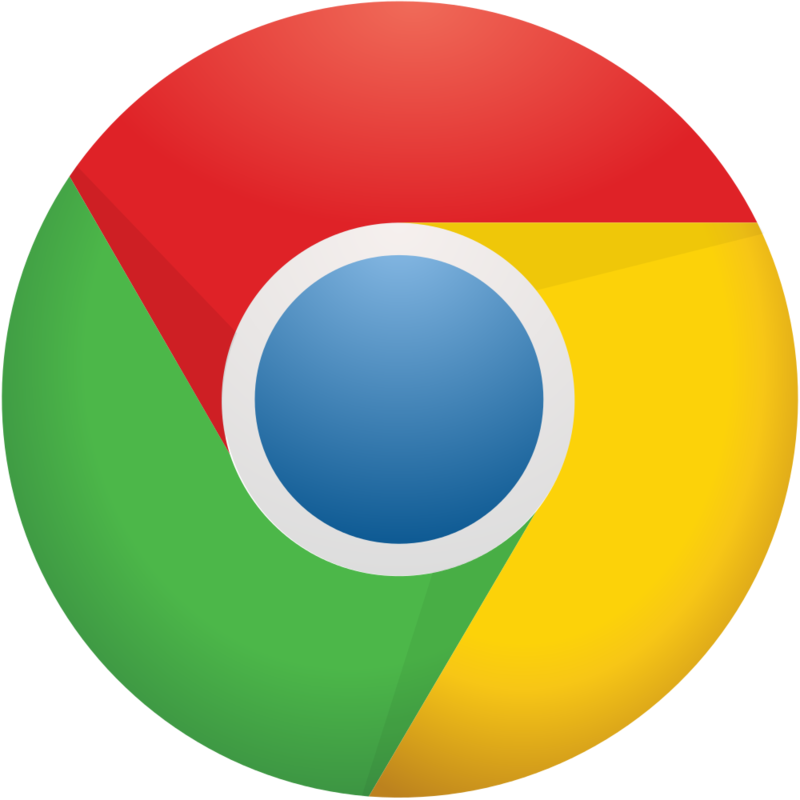 Google Chrome is quickly becoming one of the most popular web browsers out there. People like it because it is so fast. On top of that, it works well with Google applications. For example, if you use Gmail, Google Docs, or Google Drive, it just makes sense to run Google Chrome. Plus, if you use an Android phone, you can run Google Chrome on your computer and stay signed in across all of your devices. It’s also really easy to sign into web proxies when you use Google Chrome. First, you need to click on the Chrome menu. You’ll find it on the browser toolbar. Go to the “Network” section and click on “Change Proxy Settings.” A box will pop up. Enter your proxy settings into the box and save your changes. Then, you can start browsing without worrying about detection. When you are done, you can remove your settings and go back to using your home network once again. Mozilla Firefox has long been a favorite for internet users. In fact, it’s right up there with Google. It’s also fast, and it has a lot of add-ons that improve people’s internet experience. If you use Mozilla Firefox, you just need to go through a few simple steps, and you’ll be browsing the internet anonymously in no time at all. Firefox has changed quite a bit over the years. If you have entered proxy settings into the browser in the past, you’ll notice that it isn’t the same anymore. Before, you double-clicked on the Firefox icon and went through a series of steps. Now, you start from the Firefox menu. The browser has eliminated several of the steps. Now, the menu that you click on looks similar to Google Chrome’s menu. Under “Connection,” click “Settings.” A dialog box will pop up. Click “Manual Proxy Configuration,” and enter your proxy settings. Save your settings and start browsing the web. Microsoft Edge is Microsoft’s newest browser. If you have Windows 10, there is a good chance that you use this browser. That means there is a good chance that you need to know how to add proxy settings to it. As with most web browsers, this is a simple process. Start by clicking on the Edge menu. Then, click on “Settings” and scroll down to “View Advanced Settings.” Go to “Proxy Setup,” and click on “Open Proxy Settings.” Go down to the “Manual Proxy Setup,” and input your settings. Opera might not be as popular as the other browsers on this list, but it has a niche market, and for a good reason. It is full of features that people love. First, it has built-in ad blocking. You don’t need to install an extension or anything to activate the ad blocking feature. It also has a power saving mode that detects when your laptop is running low on power. It conserves power so you don’t run out of power as quickly. People also like the way that YouTube videos pop out. This is similar to how YouTube videos play on mobile devices. If you’re watching a video on your Android phone, it pops out from the web browser so you can watch it. The same is true when you watch YouTube videos on the Opera web browser. These are just a few of the reasons that people use the Opera browser. If you use the browser or if you’re thinking of switching now that you know all of the cool features, you need to know how to set up a proxy. This is simple to do. 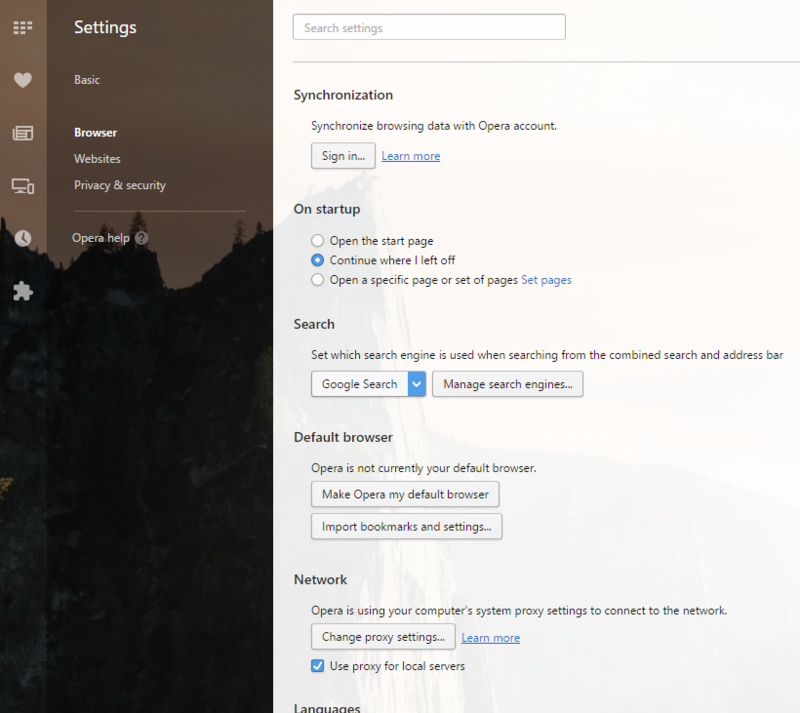 Start by clicking on the Opera menu in the upper left-hand corner of the browser. Unlike the other browsers, the Opera menu actually says “Menu,” so you don’t have to search to determine which icon is the menu. Then, click on “Settings,” and go to “Browser. Click on “Change Proxy Settings.” Then, enter your proxy settings. Now that you know how to enter your proxies into the most popular browsers, it’s time to look at some tips for using your proxies. These tips will give you an upper hand when browsing anonymously. Speed is important when using a proxy. You don’t want your proxy to hold you back when you’re browsing the internet, so you need to choose wisely. There are a few things to keep in mind when thinking about speed. First, check the proxy’s bandwidth. Most companies list the proxies’ bandwidths online, and some go all the way up to 1 Gbps of unmetered bandwidth. If you have that much bandwidth at your disposal, you aren’t going to have any trouble doing all of the surfing that you want to do. Second, make sure you go with a private instead of a public proxy. Even if a public proxy says that it’s fast, that’s likely not true. For instance, you have to share bandwidth when you use a public proxy. It might say that you’ll have access to a certain amount of bandwidth, but once you share it with 1,000 other people, you’ll move at a snail’s pace. On top of that, public proxies are often slower because they typically run ads. Think of how much slower a web page runs if it has ads on it. You have to wait for the ads to load before you can progress. That can slow you down considerably. If you don’t want to wait every time you go to a new page, you need to stay away from the public proxies. Finally, a lot of the public proxies have viruses or install bloatware or spyware on your computer. As you know, both can make your computer run really slowly. You’re not going to get any serious browsing done if you have to contend with viruses or bloatware. You can avoid these problems by sticking with a private proxy. Most people don’t realize that there are different types of web proxies available, and they all work with the various web browsers. While you can always change the type of proxy that you use, it’s still a good idea to take the time to think about the type of proxy that you want. Semi-dedicated proxies aren’t completely dedicated, but they aren’t the same as public proxies. Instead of sharing these proxies with the public at large, you only share them with two other people. That allows you to cut costs on your proxies while still maintaining a great deal of privacy. However, since you’re sharing IP addresses with other users, you shouldn’t use semi-dedicated proxies for social media accounts. The other users could engage in a behavior that gets your IP address banned, so it is better to use one of other options if you plan to visit Facebook or other social media sites. If you want to use the proxies for social media accounts, dedicated proxies are a better option. These proxies cost slightly more than semi-dedicated proxies do, but you will be the only one with access to them. That means you don’t have to worry about other people’s behavior when you log into your proxies. Finally, you can use rotating proxies. This gives you the power to change IP addresses while you’re browsing. The system does it for you so you don’t have to mess with it. This is a good option if you’re using proxies to make a lot of requests. For instance, if you’re scraping data or copping sneakers, you need to make a lot of request and networks can get suspicious. By changing IP addresses, the networks don’t realize that the requests are coming from the same person. That gives you additional anonymity. Proxies open up the door to do a lot more online. You can scrape the web for data, cop sneakers, and more. Best of all, you can automate a lot of the processes. You don’t have to spend your days and nights in the trenches, getting the job done. Of course, you have to get the right tools in place in order to make that happen. Once you have your proxies in place, ask yourself if you need any additional tools to go with your web proxies. If you want to become an SEO machine, consider installing ScrapeBox or another SEO tool. ScrapeBox is full of features that will help you boost your website to the top position in Google. Best of all, once you let it know what you want it to do, it will take the reins and make it happen for you. Sure, you’ll have to stay on top of everything, but it automates a great deal of the process. That way, you won’t have to put hundreds of hours into the process of ranking your site. If you’re a sneaker guru, look for sneaker bots to help you cop your favorite kicks. Bots like EasyCop Ultimate do the shopping for you. Just let them know what kicks you’re looking for, and they go out on launch day and put them in your virtual shopping cart. Then, they go through the checkout, figure out the CAPTCHA, and send the sneakers to your house. That’s a lot easier than trying to do it on your own. These are just a couple of examples. Proxies are compatible with a ton of tools. These tools make it much easier to accomplish your online goals. When you start using tools, you might realize that you don’t have all of the resources you need to make them run. For example, ScrapeBox and EasyCop Ultimate can both do quite a bit in a short period of time, but they can tax your computer. Your proxy can only do so much to keep them going. If that is the case, consider an SEO or sneaker server. A VPS server has dedicated resources you can use. These resources make it easy to run additional software with your proxy. Best of all, you can log in from anywhere, so you won’t have any trouble managing your online tasks. Proxies open up a whole new world of anonymous web browsing. Once you open up that world, you’ll be amazed by everything you can do. From watching Netflix without the boss knowing to doubling down on your SEO plan, there is no limit to what you can do with these proxies. Start by choosing the type of proxy that you want. Then, input the settings into your web browser and walk through the newly opened door.